Updated: Mozilla recently released the final version of Firefox 3.5. Here's your one-stop guide to the key new features in the latest version. Mozilla is adamant that 3.5 offers significant speed improvements. Hardly surprising, but Mozilla claims that 3.5 is up to 10 times faster than Firefox 2 and twice as fast as Firefox 3.0. "Websites should feel snappier and complex websites should be able to do more things, " says Mike Beltzner, Mozilla's Director of Firefox Development. The organisation has even started a teaser campaign inviting Firefox fans to submit videos of something they can do very fast! Otherwise top of the features lists are the Internet Explorer 8-matching private browsing as well as a geo-aware function. Sadly, one thing that hasn't quite made the cut is an integrated version of Ubiquity, called Taskfox. This is still very much in the development phase and may make it into 3.6, slated for 2010 and codenamed Namoroka. The browser was originally going to be branded Firefox 3.1, but Mozilla decided that the range of improvements offered would merit the 3.5 moniker. "As recently proposed, the version number of the Shiretoko project will be changed to Firefox 3.5 before the upcoming fourth beta release," said Beltzner back in March. One of the biggest enhancements is 3.5's support for open video standards. Mozilla is determined to make web video open source and treat web videos as part of the page rather than an isolated bit of Flash. 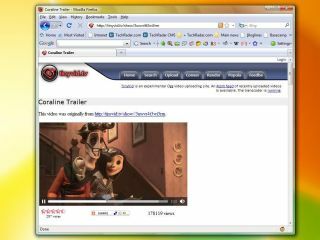 Called the Open Video feature in Firefox 3.5, this will mean better linking and better commenting in due course. In a move that will have interesting implications for Adobe Flash, the browser even integrates its own video player based on Ogg Vorbis and Theora, while there's also the ability to save a video to your desktop, too. 3.5 does boast a lot of usability enhancements too; Firefox now matches Chrome and Safari enabling you to tear off tabs to create a new browser window, for example. It also enables you to restore not only recently closed tabs but also recently closed windows, too. A smarter session restore feature means you can choose which terms you want to reopen, so you won't end up opening a tab that crashed Firefox in the first place. The Awesome bar is great, but it can get a little cluttered when you type a generic phrase into it. You'll be able to use special characters to really filter down the results such as an asterisk after a word to just see your bookmarks containing that word.